Spending the holidays in Ahmedabad and away from my typical Christmas and New Year’s traditions and family and friends was such a unique experience, unlike anything I’ve had. Manav Sadhna staff, teachers, and volunteers become your family. It was one of my favorite Christmas’ I’ve had. 150 older students and 50 preschool children from Manav Sadhna centers and various programs participated in the Jai Jagat theatrical production. I had the opportunity to travel for a weekend holiday to Gir National Park and was able to witness lions, monkeys, peacocks, deer, and buffalos in their natural habitat in the wild. 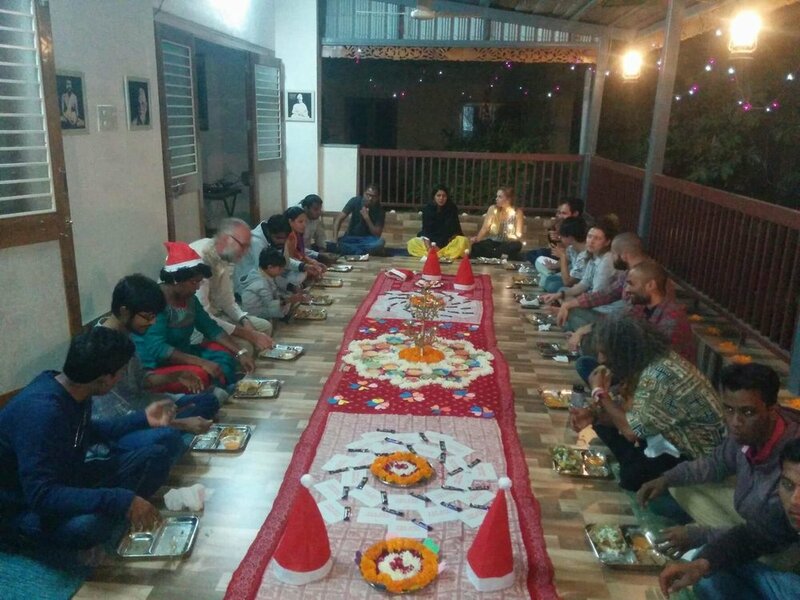 Virenbhai held the Christmas Eve celebration at his house. I helped decorate the tree in the backyard and the outdoor patios. We had Mexican food, sang Christmas carols, read the Christmas stories of “Twas the Night Before Christmas” and the Bible passages in Luke chapter 2. The next day the children at Kiran Center also celebrated Christmas by watching the “Twas the Night Before Christmas” story, had a special treat, learned a couple of Christmas Carols, and danced. They love to dance any time they get the chance. I taught the 5th standard how to make Christmas wreaths with colored tissue paper. The students loved doing this craft; they aren’t used to doing art, craftworks, and having the opportunity to be creative. For New Year’s Eve, some of the volunteers got together at the park, tossed the frisbee at the Sabramati River Front, went to Ashray’s for a nice dinner, then enjoyed the evening on the rooftop of an apartment building, and listened to the dance music that was playing at a hotel while watching the fireworks throughout the valley of Ahmedabad. I have never witnessed such a special event as the Jai Jagat live production of dancing and acting with such a powerful message. The main theme was that we all can be superheroes. Nimishbhai had the idea of involving as many of the children as possible through dance and wanted to teach them how to love, serve, and respect all creatures and mankind. Him and along with five choreographers (Manav Sadhna teachers and volunteers) with one working from LA, produced most of the dances for the students. Gandhiji, Malala Yousafzia, Dalai Lama, Nelson Mandela, Jane Goodall, Wangari Mathaai, Jose Mujica were the main superheroes of our times that were highlighted. I was so moved by this production; it brought me to tears. This also brought tears to many parents, teachers, staff, and to the public audience. These children acted and danced with such maturity and passion for these spiritual giants of our times. I tried to do a reflection with my 4th and 5th standard students who attended to see the production. I quickly learned that they don’t start to learn critical thinking skills until the 7th standard because it was a challenge for them to ponder on how they can be a superhero. Young students are used to copying from the board with little engagement in government schools. It is one of my goals to encourage my older students to do reflection for value-based lessons once a week. I hope to send the message that it’s normal to have your own thoughts and opinions in life. I was invited by another volunteer and her local friends to go to Gir National Park. The park is about seven hours away in the south part of Gujarat State. The sanctuary hosts about 200 lions. It was breathtaking to see various creatures in their natural habitat. I saw a male and a female mating then another pride of three cubs and the male and female adults. I was so close that all there was between the lions and me were sagebrush and the bank of a canal. I also went to a nearby village in the Kutch district where I visited the locals, drank fresh buffalo milk, and enjoyed listening to an older gentleman playing the ektara. The food was delicious as always; one of the dinners was at a farm to table restaurant. It was some of the freshest food I’ve eaten here. The next day on our way back to Ahmedabad, I stopped at a Hindu temple called Tulsi Shyam Temple that has two shrines. One of them sat on the hill where you had to climb several flights of stairs. As I meditated at the top, several older women joined me. They started to do bajan which is to sing Hindu mantras together. It was one of the most spiritual moments of my life. I am just so humbled to be part of this teaching fellowship. To have several these spiritual moments in India is something to behold.